DescriptionSika Primer-206 G+P is a black, moisture-curing liquid primer specifically formulated for the treatment of bond faces prior to application of Sika polyurethane adhesives. Black pigmented Primer for various substrates. Sika Primer-206 G+P is a black, moisture-curing liquid primer specifically formulated for the treatment of bond faces prior to application of Sika polyurethane adhesives. Black pigmented Primer for various substrates. Sika Primer-206 G+P is used to give improved adhesion in adhesive bonding applications on substrates such as glass, ceramic coated glass, and painted surfaces. 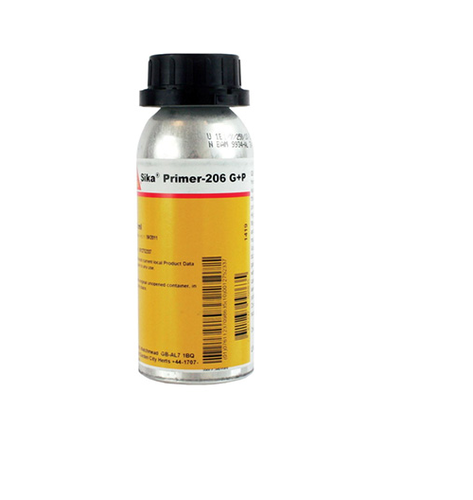 Sika Primer-206 G+P can also be used on other substrates such as plastics and some metals. This product is suitable for experienced professional users only. Tests with actual substrates and conditions, especially boundary temperature conditions have to be performed to ensure adhesion and material compatibility. Established in the year 1987, KV Enterprise is engaged in manufacturing and wholesaling of Insect Screens, Rubber Beading, Mosquito Mesh, Rubber Profiles, Gym Mat, Rubber Mats. These products are extremely admired in the industry owing to their characteristics and low prices.